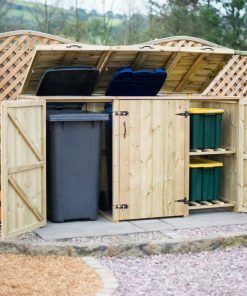 What Kind of Bin Store is Best for You? 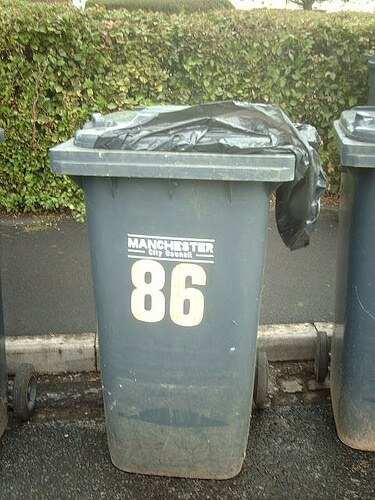 If you've got a wheelie bin, and let's face it, who hasn't, then there are plenty of options for you when it comes to making your property look great. Believe it or not, there are tons of stores, screens and fences that will help you keep that wheelie bin hidden away. But choosing between them might seem difficult. That's why we're here. We're going to take a look at your four main options, giving you the pros and cons of each, so that you know exactly what you're getting into! Of course, your first option is to do nothing at all. You've got a wheelie bin, or a couple of them, and you can just leave them sitting on your property, no further thought needed. This isn't necessarily a bad option, depending on your needs. There are pros to doing nothing at all. Obviously, this is the cheapest option, since you won't be buying extra accessories. You'll be able to put your wheelie bins wherever you please, and have lots of flexibility to move them around if necessary. Getting into your bin will be easy, and moving your bin to the kerb for pick up will be simple too. Particularly if you live in a rental or are thinking about moving soon, doing nothing at all could be a good plan. But there are downsides. Mostly this is because wheelie bins aren't exactly attractive, they're an eyesore and can bring property value down due to decreased kerbside appeal. Most of us would prefer to hide our bins away, even if that means spending a little extra. And shielding that smell a little wouldn't hurt either. This is why many people do decide to make a small investment rather than letting bins just sit outdoors. So, assuming that you want to hide those bins, your next option is going to be a screen. Screens are generally made from willow or some kind of woven material, in much the same way that a windbreak is, and again, they've got pros and cons. On the pro side, screens are generally the cheapest option. They're fairly easy to put up, since you don't need to construct anything or put anything together. They'll also do a great job of hiding your bins and blending into your garden. Access to bins is easy, since there's no lid on a screen, and getting your bins in and out is simple too, since one side is generally left open. Maintenance is also very low with screens, there's really nothing that you need to do. The cons? Well, screens aren't always the most durable option, depending on how well they're installed they can fall or be blown over. They also don't hide the entire bin, being open at the top and on one side, and don't do much to shield smells either. Plus, you have less flexibility when it comes to positioning, since you'll need to place a screen against a wall or a fence. You'll almost certainly need to replace a screen within a few years, since they're not particularly long lasting and can usually not be treated with wood stain or other preservers. Moving up a step from screens, there are some fence screens available too (sometimes also known as a picket store). These can be a nice compromise option, being more affordable than a store but more durable than a screen. And as you might expect, they have some of the pros and cons of each of these choices. The biggest pro of a fence is that it's sturdier and better constructed than a screen and will therefore last longer. Again, it's open at the top so getting into your bin is no problem. Given that this is a three sided structure (both ends are closed, and bins are removed through opening doors) a fence store will also do a better job of hiding your bins too. However, a fence is more expensive than a screen, and a little more difficult to construct, there will be some building here before you can put the fence store up. You'll have some maintenance too, since wood will need staining to prevent damp and fungus. And again, you have the same positioning limitations, since you'll need to put a fence against a wall to be sturdy. And whilst bins are more hidden than with a screen, they're still not completely hidden, and they're still pretty smelly as well! 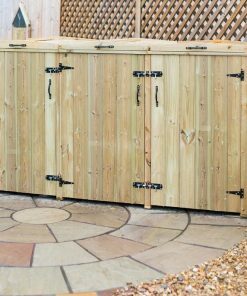 Your final choice is a bin store, that is a specially constructed wooden box that will contain your bin (or bins) completely. This is the high end option, so you can expect lots of pros, but there are a few cons too. The biggest pro of a store is that it's contained, bins are completely out of sight, smells are shielded, and you can place a store wherever you'd like (not necessarily against a wall or fence). They protect your bins from animals too, and are long lasting and durable. A store might be more expensive, but you're unlikely to need to replace it any time soon. As we said though, you can expect a store to be more expensive than other options. Plus, there's construction too, since you'll receive a flat pack and have to spend time and energy putting a store together (though it's not especially difficult). A store does have a lid which can make accessing your bin a little more complicated (but many stores have chains to connect the lid to the bin lid meaning you can open both with one movement). Your choice comes down to what you need and how much money you're willing to invest. A bin store is generally the best option, but it is going to be a bigger investment. You'll need to think about placement, about budget, and about convenience too (you don't want a bin that's too far from your door or no one will ever take the rubbish out!). Consider all the pros and cons before coming to a decision, and choose wisely! What Happens to Our Rubbish?